It’s hard work trying to keep up with all the great beer happenings in New Orleans this spring. “Previews” of upcoming events quickly become sometimes hazy recollections as time and beer itself overtake events. But it’s still not quite too late to take in a couple of other big things happening this Saturday, April 20. If you pace yourself, you can enjoy them and maybe even at the same time. 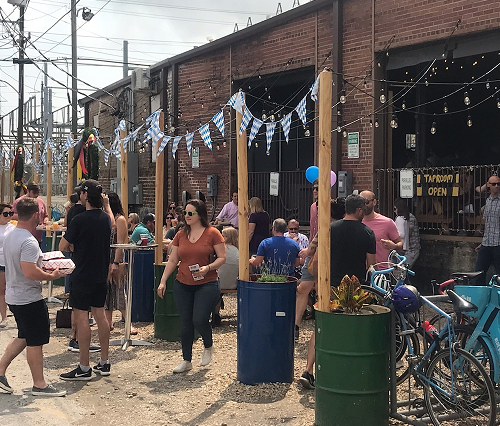 NOLA Brewing is hosting the 10th Annual Easter Keg Hunt starting at The Tchoup Yard, at 405 Third St, but with entry on Second St. Registration is at 2:00 PM, and the first clue will be given at 3:00 PM. Loose lips say that a couple of well-known Garden District purveyors of beer will be on the uptown-ish route. (Like maybe this place?) But no promises, and no hints about clues!) Nobody is giving away the final destination, though, where there will be food, music, and beer, beer, and more beer. Proceeds from this fun and worthwhile event support Healthy Gulf, formerly known as the Gulf Restoration Network. Tickets are available at http://www.healthygulf.org/keg10. Another great big beer thing is Hopfest at the Courtyard Brewery at 1020 Erato St. Courtyard. This is (ahem) a “well-known Garden district purveyor of beer” (wink, wink, nudge, nudge). If you don’t feel up to wandering about uptown hunting the Easter Keg, you can park yourself here. Who knows. Maybe the Easter Bunny or some interesting and festive imposters might wander in. A VIP ticket gets you a wristband, always a sign of good taste and breeding, and plenty of free tastings starting at 11:00 AM. The Hopfest list of brewers from near and far looks fascinating: Abita Brewing; Alvarado Street Brewery of Monterey, California; Amplified Ale Works of San Diego, Aslin Beer Company of Virginia; Barrier Brewing of Oceanside, New York; Bayou Teche Brewing of Arnaudville; Brieux Carre; Brouwerij West of San Pedro, California; Burial Beer Co. of South Carolina; Cerebral Brewing of Denver; Crying Eagle Brewing of Lake Charles; Finback Brewery of Glendale, New York; Gnarly Barley Brewing of Hammond; Great Notion Brewing from Portland, Oregon; Magnify Brewing Co. of Fairfield, New Jersey; Mumford Brewing of Los Angeles; Odd Breed Wild Ales of Pompano Beach, Florida; Parleaux Beer Lab; Pinthouse Pizza Brewing of Austin; Port Orleans Brewing; Pure Project Brewing of San Diego; RAR Brewing of Cambridge, Maryland; Southern Grist Brewing Co. of Nashville; Southern Prohibition of Hattiesburg; The Bruery of Orange County, California; Tin Roof Brewing of Baton Rouge; and Urban South Brewery. Urban South (1645 Tchoupitoulas Street) celebrated their Third Anniversary on April 6. 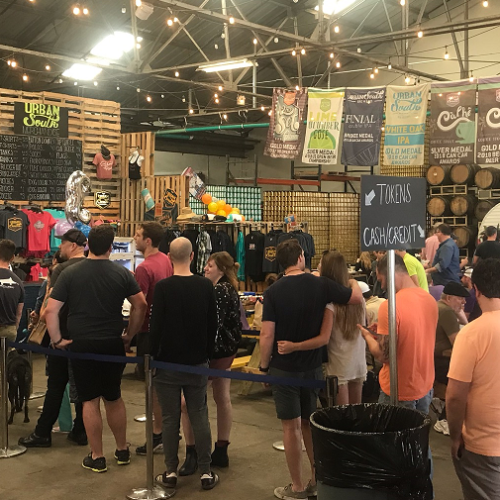 From modest but ambitious beginnings, Urban South is now (I think) one of the three or four biggest Louisiana breweries. 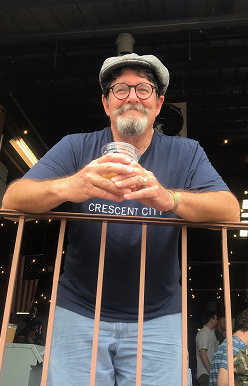 That Saturday, I was past ready for beer after laboring over a hot stove all morning at Crescent City Cafe (where a fancy breakfast is served free to anyone on the first and third Saturdays.) So I pedaled right over to catch the early part of Urban South’s festivities.The place was packed by noon, and the picnic tables were covered with heaps of crawfish and stacks upon stacks of canned beer brewed specially for the occasion. Founders Jacob Landry and Kyle Huling — and family members — were on the job and on the move — meeting, greeting, serving, and generally enjoying their well-earned success (whenever they had a minute to sit down). Although I couldn’t stick around all day, I knocked back four lovely pints of beer with embarrassing alacrity. The last one was “Blue & Bean” a blueberry coffee sour. I had to try it, if only prove that I don’t like those ubiquitous fancy-schmancy novelty beers. But it blew my mind. My brain didn’t know how to handle the back and forth tennis match in my mouth between the coffee and the blueberry. The crowd was happy and a band was jamming, but the lines were long, showing that Urban South really is one of the big guys now. The other special birthday was Brieux Carre’s Second Anniversary on Saturday March 30, though the actual anniversary was April 1. Brieux Carre is the labor of love of Robert Bostick and partners, and all the love was on full display. 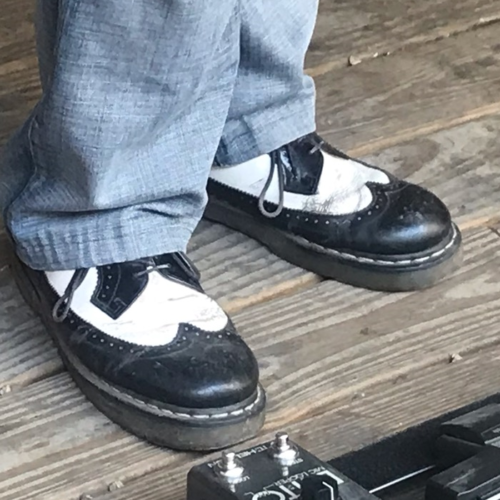 While Urban South featured three or four bands throughout the day, music at the Brieux was by Casey Saba, a one-man band with a repertoire like a karaoke machine — and great shoes. Brieux-Carre’s usually-closed side courtyard was opened up, where there were tables and chairs, taps for some of the 40-something varieties of well-crafted beer, and a couple of food tents serving yaka-mein in various combinations, and unique tacos and sliders, including a smoked peanut butter, jelly, and home-made pickle slider that was better than you think. It was a great New Orleans scene, the kind that makes you wonder why anyone would ever want to live anywhere else. 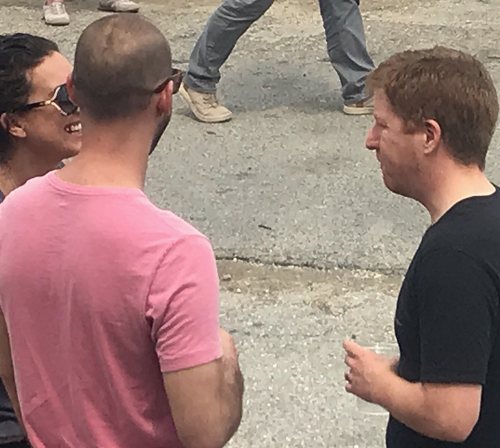 The weather was fabulous, and the crowd was diverse, jovial, and radiating that vibe of good cheer and comradery that seems a specialty of New Orleans at its best. 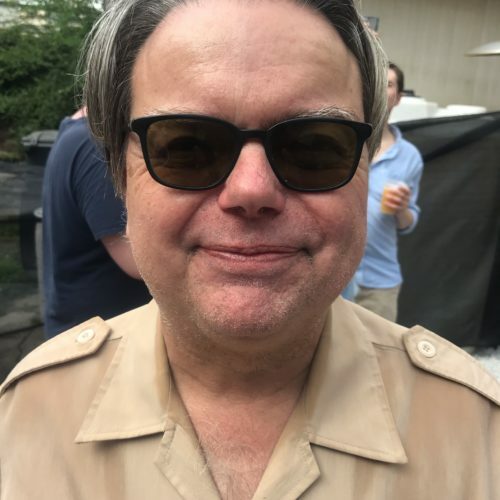 As to that, I can only paraphrase “Safari” John, a familiar fixture at almost every beer event in town in his tradewant khaki guayabera shirt. As we waited in line for the Bananas Foster beer, he looked around and said, “In New Orleans, we don’t tolerate crazy or different people, we enjoy them. We celebrate them!” At least one visitor was from as far away as Sweden. Also sharing in the joy of the day were Alex Peyroux and Janice Montoya of Miel Brewery, another local labor of love. 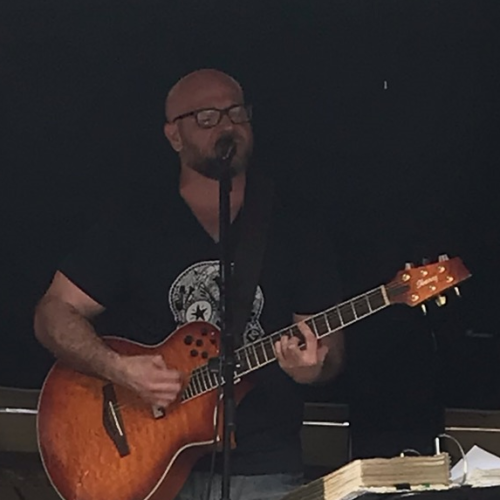 It’s hard to nail down, but there seemed to be a casual air of neighborliness that was lost in the energetic and almost homogenous hipness of the big crowd at Urban South. But each place is a gem in its own way. Speaking of gems, and cheap segues, “Someone Who Knows” says that the Gem Theatre, former home of the late and lamented Wayward Owl Brewery, is expecting a new tenant who will more fully utilize all of the property at Thalia and Broad. No timeline was given, but it’s something to hope for and to look forward to. 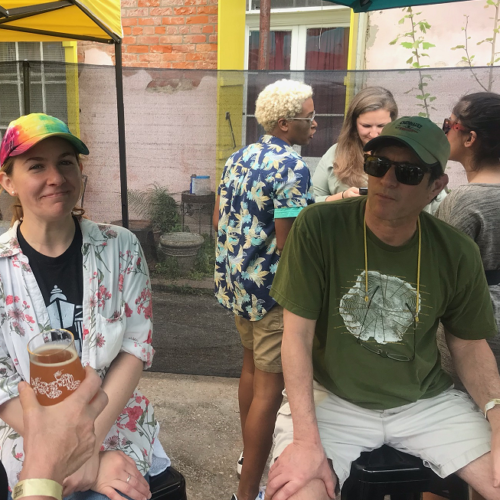 Louisiana Beer Maven and Utmost Knower-Abouter Nora McGunnigle reports the demise of Cajunboyz Brewery taproom in Reserve. The location proved too much of a challenge, but the brewers say they’ll keep home-brewing and having fun. So look for them at local festivals. Here’s a link to the Louisiana Craft Beer Magazine, edited by Nora. There you will find more links to Louisiana craft beer news. As always, you can keep up with New Orleans craft beer brewers by following them on the WWW. 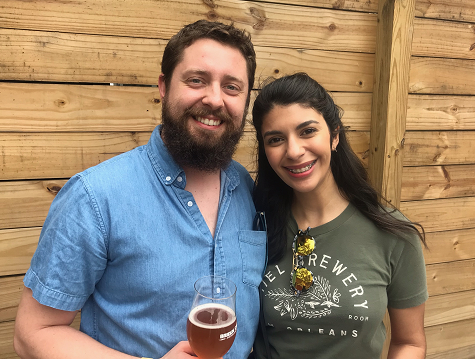 Here’s an updated barebones list of New Orleans brewers, with links, that I will endeavor to update and include as often as I write. 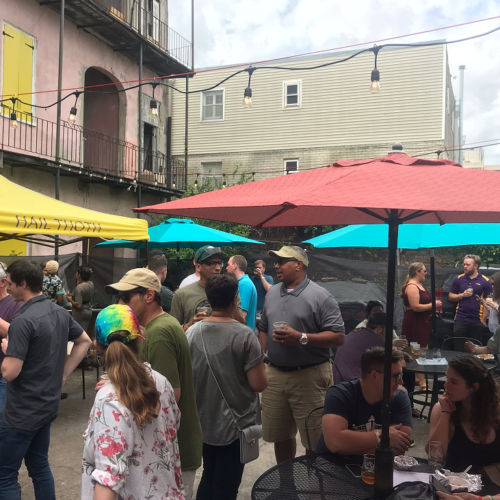 Brieux Carre; Courtyard Brewery; Crescent City Brewhouse; Gordon Biersch; Miel; NOLA Brewing; Parleaux Beer Lab; Pidgin Town Brewing; Port Orleans Brewing Co.; Royal Brewery; Second Line Brewery; and Urban South. Tell me if I left anyone off! And feel free to inform, amuse, advise, question, or chastise me at kevsbeerthing@gmail.com.